Over the last year the Department has been undertaking a review of its policies regarding ports. The contribution of ports to sustaining our economy and standard of living is crucial. Our success in globalised markets depends, in part, upon the ability of ports to adapt and operate efficiently as gateways to international trade. This interim report is the first output from the review, and, following a Discussion Document and extensive consultation last year, sets out our general conclusions about the future direction of ports policy for England and Wales. It also prepares the ground for a further statement later this year, which will focus on inland connections in particular. Demand for port capacity will grow. In the container and ro-ro sectors, we expect an average annual growth rate of around 3-4%. In time, this growth will require a significant increase in capacity, beyond that which has already been approved in the last two years. Against the background of strong industry growth at the global level, the Government expects that the market will be ready to fund further expansion, especially as we propose no substantive change to the regulatory and operating framework for ports. We also confirm our view that commercial port operators are best-placed to make decisions about where and when to invest in the port sector. We see no additional benefit from a locally or regionally determinative ports policy. But we need to ensure that the way in which the industry develops takes full account of both the adverse impacts and the benefits, locally and regionally. setting out our plans to enhance the port safety regime. stress the need at European level for transparency in public funding for ports and inland infrastructure. A crucial aspect of port policy is inland connections to ports, but we need to establish inland access policy in the context of the Department's wider consideration of the Eddington Study recommendations. This interim report will therefore be followed by a further substantive statement alongside the Department's response to Eddington and Stern. The conclusions from the Ports Policy Review as a whole will reinforce the conditions in which the port industry can continue to thrive and serve the economy long into the future. 1. As the UK's economy and the global economy continue to grow, so does the demand for port capacity. For this reason the Government undertook in the 2004 Future of Transport White Paper to take stock, once decisions had been taken on the major container terminal applications then outstanding, of how the ports industry is set to meet the country's overall needs in the longer term. The review, which covers England and Wales , was intended to clarify the Government's role in the ports sector and address key issues such as how to respond to forecast global growth in shipping traffic and how to ensure that the road and rail improvements needed to serve future major port developments are brought on stream effectively. 2. The Ports Policy Review was launched in May last year with a discussion document Ports Policy - your views invited. The closing date was 1 September and a summary of the responses received is available on the DfT website. In parallel, the Government also asked Rod Eddington to advise the Government on the long-term links between transport and the UK's economic productivity, growth and stability within the context of the Government's commitment to sustainable development. Rod Eddington's report, Transport's role in sustaining the UK's productivity and competitiveness, was published in December. changes to the Planning process for major transport projects. 4. The availability of sufficient port capacity is a potentially significant constraint on future economic growth. Equally, congestion on port access routes and the wider inter-urban network, already a problem in the South East of England, could act as an additional constraint. It is therefore the Government's intention to address these issues together as part of an examination of our high-priority international links in line with the recommendations of the Eddington Study. We will set out our conclusions on this alongside our response to the Eddington and Stern Studies later in the year. The Government's intentions for reforming the wider planning process for handling major infrastructure projects, including port developments have been set out in the White Paper Planning for a Sustainable Future. Our approach, including the concept of National Policy Statements, is currently the subject of consultation. Meanwhile, proposals for marine planning were set out in another consultative White Paper, A Sea Change, which will bring about similarly radical changes in the marine environment. These include the establishment of a Marine Management Organization (MMO) which will in future help to streamline the planning process for harbour developments below the scale of major infrastructure projects. 5. Completing this wider work on inter-urban and international links obviously delays some aspects of our review of ports policy. However, the response to our consultation already allows us to draw a number of general conclusions about the direction of ports policy for England and Wales in the future, and make some specific proposals on some aspects of ports policy. This interim report sets out these conclusions and proposals and places them in the context of the further work that is being done as part of the Department's response to Eddington. 6. In parallel with this interim report by the Department for Transport, the Government is making a formal response to the Transport Select Committee's reportid=2b name=2b>  on the ports industry in England and Wales. 7. As the Eddington study noted the UK's ports currently handle an impressive volume of freight; with 580 million tonnes handled in 2006 the UK's ports handle a higher volume of goods than any other EU country. They are key international gateways plugging the UK into the global economy. The forecasts we published alongside the Ports Policy Review discussion document  showed that overall demand between now and 2030 is expected to grow by around 1% per annum in tonnage terms. Within this figure there are very significant commodity variations, with some sectors — notably containers, ro-ro and liquefied natural gas — growing much faster. At times of high demand, such as the autumn peak period, congestion at some container ports would, if capacity shortages were not addressed, delay the supply of containers to customers significantly. Recently approved expansions, as at Felixstowe/Harwich, London Gateway and Mersey, should help to ease these constraints to around 2020 — but our forecasts suggest that further capacity will be needed beyond that time. CAGR = compound annual growth-rate. roll-on - roll-off terminal capacity in the South East, serving short-sea routes to the Continent. 9. Meeting this demand will be important if ports capacity is not to become a constraint on the economy. We set out below how we believe this capacity is likely to be provided and the role of government in ensuring it is in place when required. But in pursuing increases in port capacity to underpin and respond to continuing economic growth and individual prosperity, it will be essential to ensure that new developments are provided in a way that is sustainable, minimising the impact on the environment both locally and more widely and not just adding to the congestion that we already face on some of our key inter-urban links. We therefore also describe how we plan to balance the economic benefits of new ports capacity against the environmental pressures and other adverse impacts that it might generate. 10.Aggregate Capacity The ports sector is a thriving and profitable one. Recent ownership changes backed by infrastructure investors and pension funds seeking robust long-term returns are evidence of the attractions of the sector, and reflect global trends towards investment in infrastructure by investors seeking to build value by holding assets over the longer term. In line with the Eddington recommendations we will be looking to recognise and respond to these changes in financial and infrastructure markets to make the most of the new opportunities they offer, while remaining alert to any new risks that might arise with changing market circumstances. 11. Investment in already approved new developments at the major container terminals should add capacity for around 7.3 million teu  over the next decade or so. Our major trust ports have also been increasing capacity to respond to increasing demand in other sectors, with tonnage last year up 13% at Dover, and 21% at the Port of Tyne, and we set out below how we can continue to make the most of these ports' potential to contribute to meeting growing demand. Overall, we judge that, since we do not intend to change the regulatory and operating framework for ports in England and Wales in a way which would discourage continuing investment, we believe that the market will continue to provide the additional capacity needed in England and Wales. We set out below key aspects of how the current regulatory and operating framework will achieve this — including through ensuring effective competition in the sector — and where changes might be required; and we will be looking further at this in our continuing work on ports in the Eddington context. 12. Regional Capacity In our discussion document, we also set out a range of regional issues that might need to be addressed within an overall national approach, including the degree to which the Government might need to set out a structure for how it would wish to see ports develop in each region. Ports are significant local employers and can make an important contribution to the regional and local economy. 14. Maintaining the right regulatory and operating framework However, in carrying forward these general policies it is important that we do not become complacent about the market's ability or willingness to provide new capacity. We must recognise that the market is only likely to act if the regulatory and operating framework for ports facilitates continuing investment where it is most needed, while also ensuring that any additional capacity is provided in a way that is sustainable. It is self-evident that ports are just one link in much larger international logistic chains. Whether the market will be prepared to continue to invest, and where it chooses to invest, will in part be determined by such factors as the quality of the inland access routes to manufacturers and markets and the congestion, delay and cost of moving goods along these routes. Similarly, willingness to invest in new capacity will depend upon the scale of contributions that are required from developers for improvements to surface access links, and on the speed and certainty offered by the planning system. 15. In future, it is proposed, case-by-case planning decisions on applications for new capacity will be made by the Marine Management Organisation (MMO), or, for the largest port projects, by the Infrastructure Planning Commission (IPC). As proposed in the Planning White Paper, the IPC's decisions will be in accordance with the relevant National Policy Statement (NPS), as will be laid down in the forthcoming Planning Bill. The MMO will similarly take full account of relevant NPSs and will work within the context of a UK marine policy statement and marine planning system being taken forward through the proposed Marine Bill. We envisage that the overall outcome of the Ports Policy Review later this year will form the basis of a NPS for the ports sector. We would consult on a draft NPS once the requirements are clear, following passage of the Planning Bill. The coverage of the ports NPS could also extend to inland freight distribution infrastructure, where this is the direct consequence of port activity. 16. Our continuing work in the light of Eddington on inland links will help to target the points where new investment in inland access might most be needed. And by fully taking into account all the wider economic and environmental impacts associated with development, as recommended by Eddington, it will also help better to set out the overall balance of potential environmental and economic effects. Forecasting future demand In the light of comments from a wide range of stakeholders we have decided that we should publish updated forecasts of expected port demand every five years or so to help Government and developers assess the prospective national need for capacity in each main traffic sector, as circumstances change over time. 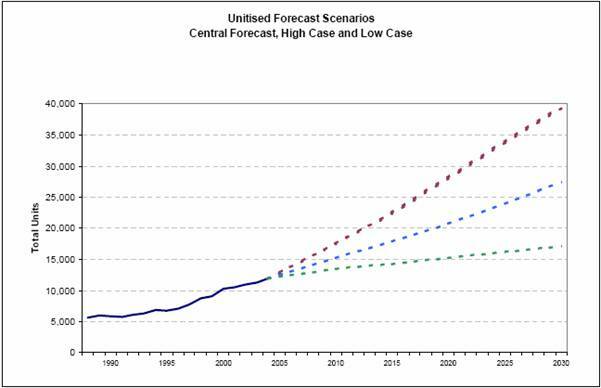 We will also monitor the increases in capacity against those forecasts on a regular basis. Port Master Plans In the light of the balance of responses to our discussion document, and building on the generally favourable experience to date with airports, we recommend to all major ports that they produce Port Master Plans, and consult on these with local stakeholders including planning authorities and regional development agencies in order to help co-ordinate medium-term planning. We will not direct them to do this, or when to do so. But we hope and expect that they will see for themselves (as, for example, the Port of Dover already has) the benefits in bringing together strategic planning information at the right stage, for each port, to help work in partnership with planning authorities, network providers, and the community at large. In particular, they will help us with addressing future needs for road and rail links to the ports. We intend to develop non-prescriptive guidance to assist those preparing such plans. there should be a strong presumption in favour of safeguarding where there is at least a reasonable likelihood of restitution to significant operational use within fifteen years and where the alternative use in contemplation is one, such as residential development, which will be difficult to reverse. within the range described by these cases, judgement based on appraisal of costs and benefits should be exercised by decision-makers in the planning system. 18. Providing new capacity is important, but the Government does not advocate a simplistic approach of leaving the market to 'predict and provide'. Our policy interventions must be founded on the need to tackle all potential market failures, including on sustainability issues, both local and global. This means addressing the adverse environmental (including climate change) and social impacts of port expansion alongside the benefits of such expansion to the economy and society. (c) that compensatory habitat be provided, in advance of the development. Guidance on the application of these tests has been provided in the Department's publication A Project Appraisal Framework for Ports. This provides in essence that the proposer must demonstrate that conceivable alternatives (as defined by the Directive), such as could deliver similar benefits with less damage to habitat, do not exist within its control; while opening to objectors the opportunity to come forward with alternatives of their own, if they can. However, there are problems with this approach as it stands. In particular, the definition of what will constitute the imperative public interest is left for determination very largely on a case-by-case basis. So too is the definition of what constitutes an 'alternative'. There is also relatively little to guide prospective objectors as to the criteria which will be used to assess their claimed alternatives, or when and how to present these. We will therefore seek to improve decision-making under the habitats Directive, by clarifying both what should constitute an alternative to the development in question, and where the Government identifies the public interest as lying — aided by our plans for regular forecasts of demand — and by updating the Project Appraisal Framework for Ports. Supporting and encouraging efforts by ports to reduce local pollution Ports produce and concentrate air pollution emissions due to activities involving ships, lorries, locomotives and static equipment. EU legislation sets air quality limit values and the statutory system of Local Air Quality Management requires action to be taken where pollutant concentration limits will be exceeded. UK ports have been in the vanguard of participating in ECOPORTS, a research and development project co-funded by the European Commission, together with twelve ports and port organizations. Its aim is to address local environmental issues with cost-effective response options. The Government welcomes this action by the ports and will work with them to ensure that local environment impacts are reduced where possible. In particular, we would like to see ports work harder to reduce emissions from ships while alongside by the provision, where feasible, of shore-side fixed electrical power supplies to replace ships' generators while in port (a practice known as 'cold ironing'). This can substantially reduce emissions. Its application has been limited, to date, by problems of compatibility and technical standards covering the large range of ship sizes and types, and it is not yet clear that the benefits of adoption would in all cases outweigh the costs of installation and retro-fitting of equipment. However, we are actively supporting the development of an international standard for shore connection and we will in future expect newly developed terminals to make advance provision for 'cold ironing' facilities. We will also expect major ports to formulate plans for introducing such facilities at existing terminals once a standard has been agreed. 20. In a competitive global economy, it is important to keep handling costs low for both exporters and importers. And for port operators it is important that their prices are not undercut by unfair competition whether at home or abroad. The Government must therefore be prepared to intervene if there is evidence that the market is not sufficiently competitive or if competition is distorted, and to continue to work in Europe to ensure fair competition across the sector. 21. However, although there is a trend towards fewer and larger operators in England and Wales, the existing ownership structure, including a wide mix of private sector ports, trust and municipal (local authority) ports, clearly provides a basis for effective competition. In addition, in the medium term any type of commodity can switch ports, albeit sometimes at a cost elsewhere in the logistics or production chain. In the responses to our Ports Policy Review discussion document, competitive pricing regimes and high efficiency levels were all cited as evidence for a competitive domestic sector and respondents were generally confident about levels of domestic competition. In any case, the protections of normal competition law apply to ports, and the OFT has on occasion undertaken investigations without, as yet, exposing any cases of abuse of market dominance. In addition to these usual protections, s.31 of the Harbours Act 1964 provides for a right of appeal where harbour dues are alleged to be excessive. The fact that appeals under this provision have been few, and largely limited to small-scale users, provides further reassurance that there is at present no large-scale abuse of local monopoly power. 22. The Department therefore concludes that existing arrangements, including the OFT's general role in guarding against anti-competitive practices, are sufficient to sustain competition. We welcome the fact that the degree of competition in the deep-sea container sector, where there is least diversity in ownership, is enhanced by dynamic Continental hubs such as Rotterdam and Antwerp acting as alternatives. However, we want to ensure there is fair competition on both sides of the North Sea. We have therefore stressed the need for transparency in public funding for ports and inland infrastructure as part of our response to the Commission's consultation on a European ports policy, on which a Commission Communication is due to be published in the Autumn. 23. We need to be certain that the mix of ownership types in the ports sector works most effectively in the national interest. As has already been noted, trust ports — large and small — have a continuing important role in terms of providing essential capacity and contributing to regional and local economies. 24. While the top 15 ports account for almost 80% of total UK traffic, there are many small ports within the total of around 120 commercially active and hundreds more for which statutory harbour authority powers have been granted. These smaller company, trust and municipal ports, are important not only in terms of the capacity they collectively provide, but also for their contribution to local economies and to competition in the sector as a whole. 25. In 2000 the Department (then DETR) published guidance for trust ports on best practice in governance . Since then, regular liaison with the ports has shown that most have made good progress in adopting and implementing the principles set out in that guidance. Building on this, the Department wished to understand better how to optimise the efficiency and accountability of the major trust ports, and to this end, published in May 2007 a report it commissioned from PricewaterhouseCoopers LLP (PwC) analysing the ports' efficiency, accountability to stakeholders and options for voluntary corporate restructuring. 26. While the study concerned primarily the six largest commercial trust ports, its findings bear upon all trust ports, and on the wider ports industry. 27. In broad terms, the PwC report concludes that the trust model retains a legitimate role within a mixed ports sector but that, in the absence of shareholders, trust ports should do more to identify, and account for, the use of their overall returns — what the report terms their 'stakeholder dividend'. 28. The report also concludes that, while the largest trust ports operate on a sound commercial basis, in some cases their financial performance falls short of that of their private sector comparators, and it recommends measures to ensure that trusts, playing a crucial role in regional or national infrastructure, are able to fulfil their potential. 29. Levels of accountability among trust ports are also found generally to be good, but with room for improvement, and the resultant recommendations point towards enhanced reporting and updated governance arrangements. PwC explored various voluntary options for structural change including the creation of an operating subsidiary below the level of the trust board, which could provide a basis for inviting private sector participation. Refreshed guidance to be published We intend, later this year, to produce revised guidance for trust ports, incorporating the stakeholder dividend concept. This will reflect our considered response to PwC's detailed recommendations for improving efficiency, transparency and delivery of community benefits. Status Alongside this, we will resume work, through Harbour Revision Orders, to address the outstanding question of the accounting status of the larger English and Welsh trust ports. 31. Alongside our discussion document, the Department (in association with colleagues in DCLG and the Welsh Assembly Government) published the conclusions of the review of municipal ports  in England and Wales. This covered 61 ports: mainly small in scale, but including larger gateways such as Portsmouth, Ramsgate and Workington. The major themes included accountability and decision-making; business planning; management and performance review; and financing. 32. Good business practice in these areas makes evident commercial sense; but it is also the precondition for delivering the ports' parallel social and environmental/amenity objectives too, if these are to be achieved efficiently, to a clear plan of action. This finding of the underlying importance of clarity and transparency in management, accountability and objectives whether commercial or non-commercial, to some extent foreshadowed the findings of PwC in relation to the trust sector. And the recommendations of this report have been taken up by the ports themselves, with the British Ports Association (BPA) helping to promote good practice in ports of every size. We have also instituted 'Leading Lights' status in token of recognition for the efforts that municipal ports are making in these areas. The first recipients, in 2007, were the Port of Workington, Whitstable Harbour and River Hamble. The continued application of the recommendations is, of course, for the ports themselves to take forward. 33. While the central policy challenge turns on how we can provide the ports capacity to meets the nation's economic needs in a sustainable way, it is of course a precondition that all ports operate in a safe and secure way. 34. At the outset of the Review, we proposed that the framework for ensuring safety and security should, in essence, remain on the course that had previously been mapped out. We received a small number of representations on these issues in response to our discussion document, and the Transport Select Committee  has made a number of recommendations. We have looked at these very carefully. Our conclusion is that the present framework remains broadly correct; but that there is still scope to improve existing non-statutory mechanisms, to clarify the powers available to ports in order to maintain marine safety and to improve employment and landside accident-rate statistics. Below we set out the position for individual aspects of safety and security. Promoting national standards and good practice for port safety management. Port Skills and Safety is the ports industry’s organisation tasked with promoting health, safety, skills and standards. Formed in 2002 by the port employers, it works closely with trade unions and Government bodies such as DfT, the HSE and MCA. All these partners have a shared commitment to attain and maintain high standards of health and safety and a highly skilled and productive workforce in the ports sector. Its work on dock safety focuses on the Safer Ports Initiative, Phase 2 of which was launched in 2006. Port Skills and Safety supports a National Committee bringing together all the main stakeholders and empowered to co-ordinate strategies for port safety. There have been concerns that the National Committee is not operating as effectively as it should and we are accordingly monitoring changes to its structure that are now being implemented. We will also continue our support, through the Committee, for the promotion of training and the full recognition of the skills needed in the modern ports industry. Compliance with the Port Marine Safety Code (PMSC). We are committed to promoting agreed national standards and good practice for port safety management, without detracting from the existing legal responsibilities of harbour authorities. The Port Marine Safety Code is the framework we have set to help harbour authorities meet all their statutory safety obligations. The Transport Select Committee has recommended that compliance with the PMSC be made compulsory as soon as is practicable. However, given the need to ensure that the onus to manage harbours safely rests with the harbour authorities, we believe the voluntary approach to be the right way. Nonetheless, we must be satisfied that the Code continues to operate satisfactorily.. The MCA has completed this year its latest review of the extent to which harbour authorities are complying with the PMSC. It confirms that all Competent Harbour Authorities with significant marine activity have declared their compliance with the Code. Our support for the PMSC includes initiating a new programme of PMSC verification visits by MCA inspectors, assessing the safety management systems a harbour authority has established. The visits will focus on the small number of ports where, notwithstanding a declaration of compliance, there might be concerns that the safety management system and its supporting risk assessments are not operating to the required standard. We will also expand and develop the existing guidance on how harbour authorities undertake Formal Risk Assessment. The combination of verification visits and the further development of best practice on formal risk assessment will, we believe, provide the necessary assurance that the national standard introduced by the PMSC is being implemented. general powers of direction for harbour authorities. We will seek an early opportunity to take forward appropriate legislation. Pilotage. The need for marine pilotage is determined by Competent Harbour Authorities, who consider whether any, and if so what, pilotage services need to be provided to secure the safety of ships navigating within the harbour or its approaches. The Department reviewed, in 1998, the operation of the Pilotage Act 1987; the principal recommendation of the Review was the introduction of a Code for Marine Operations and this Code was introduced in 2000, building on the responsibilities set out in the Pilotage Act 1987. In the light of responses to the Discussion Document, we will revise the Guide to Good Practice that accompanies the PMSC, working with stakeholders to specify best practice for the issuing of Pilotage Exemption Certificates (PECs) and to improve the guidance on Formal Risk Assessment. We are also considering possible legislative changes to the 1987 Act to modernise the provisions on pilotage powers and improve the control of PECs. Employment and accident statistics . In 2005, responding to an earlier critique by the Transport Select Committee, the Department published Port Employment and Accident Rates The report found an overall accident rate in the range of 1.0 to 1.5 per 100 employees for direct businesses on port, and 0.4 to 0.6 per 100 for indirectly related businesses on port. Some respondents to our discussion paper criticized these figures, on various grounds including the possible under-reporting of accidents especially to casual or part-time workers, and arguments that the denominators (numbers employed) were over-estimated, or included too many employees in relatively non-hazardous activities. Among the report's conclusions was that similar benchmark surveys should be carried out every five years or so, and that it was feasible to track trends between surveys by exploiting other data sources. We intend to take forward these recommendations in consultation with stakeholders. Ports police review. Ports police are independent forces within the employment of the port authorities. They are not accountable in the same way as Home Office police in England, Wales and Scotland. A review of the accountability of ports police forces was promised in Modern Ports in 2000. Since that date commercial pressures and the increasing pressure on ports to become secure gateways to the UK have led to a greater focus on the valuable role played by ports police forces and there are signs that the long-term decline in numbers has been reversed. This exercise, actively underway in the past year, is examining management rather than operational policing issues. It focuses on examining the duties, powers, accountability, training and recruitment to these forces. In publishing the findings later this year we will make a number of recommendations in these areas, including the case for increased jurisdiction for ports police in recognition of their need to interface effectively with neighbouring Home Office forces. Maintaining high security standards. The International Ship and Port Facility Security (ISPS) Code was incorporated by the European Commission into Regulation in 2004. The UK's National Maritime Security Programme (NMSP) applies ISPS and now covers all international voyages of passenger ships carrying more than twelve passengers and on cargo vessels over 500 gross tonnes on international voyages, as well as the port facilities that serve them. The significantly tighter standards in ISPS have been fully accepted by the UK industry, and wholly funded by it and its customers. DfT's Transport Security and Contingencies Directorate (TRANSEC) has now approved port facility security plans covering some 550 individual port facilities in the UK. The UK regime has been sufficiently rigorous to accommodate the recently adopted EC Directive which enhances security throughout ports, and which the UK is now implementing as an extension of the NMSP and the drafting of transposing regulations. There is well-established and effective dialogue between the Department and the ports and shipping industries, and frequent consultation on implementation takes place both at national level and as part of the programme of compliance inspection and DfT participation in port security committees. We want to help the industry deliver on its undoubted commitment to achieve the highest necessary levels of port security. Implementation at individual port level will depend on local circumstances, and the tools available to the port. to confirm how the combined statements should form the basis of a National Policy Statement to inform the work of the Infrastructure Planning Commission, conforming fully to such legal requirements for these as will eventually be decided by Parliament in the forthcoming Planning Bill. The Scottish Executive has devolved responsibilities for ports, and following a review in 2006 has developed its own ports policy priorities for action through its Freight Action Plan and within the wider strategic framework of Scotland’s National Transport Strategy. At the outset, Northern Ireland was involved in the Ports Policy Review and it was included in the consultation (although Northern Ireland consulted separately on matters relating to its trust ports). Since 8 May 2007 there has been a devolved administration in Northern Ireland. It now wishes to consider how to take forward policy in relation to its ports responsibilities. Although ports policy for Wales (other than for small fishery harbours) is not devolved, the UK Government works closely with the Welsh Assembly Government on ports issues. The role of ports as part of the economic and transport infrastructure of Wales is reflected in the Assembly Government's emerging Wales Transport Strategy and the related Wales Freight Strategy. The Ports Industry in England and Wales , HC 61, January 2007. We publish alongside this report an update by MDS Transmodal of the 2006 forecasts and transhipment study, incorporating 2005 base year outturn data and taking account of the energy forecasts underlying the White Paper, Meeting the Energy Challenge, published in May; and of the capacity expansion proposals announced by Associated British Ports for Southampton. In Wales a separate strategic planning regime has been established, based around the Assembly Government's Wales Spatial Plan as well as its economic and transport strategies. The Northern Way brings together the three northern regional development agencies: One North East, NWDA and Yorkshire Forward. Such exceptions can occur, as in the case for example of the grant offered to Great Yarmouth for its outer harbour development (East Port). But much more usually, the distortion of inter-port competition brought about by such subsidy, and abstraction of external regeneration or employment benefits from elsewhere, will outweigh the case for public subvention. Council Directive 92/43/EEC of 21 May 1992 on the conservation of natural habitats and of wild fauna and flora, transposed through The Conservation (Natural Habitats, &c.) Regulations 1994 (SI 1994/2716). Modernizing Trust Ports: a guide to good governance, DETR, January 2000. Opportunities for ports in local authority ownership, DfT/DCLG/WAG, May 2006.